Russian news media used Facebook to expand its footprint in central Asia. Facebook removed more than 250 pages on Thursday for “coordinated inauthentic behavior" masquerading as special interest groups when they were actually meant to expand the reach of the Kremlin’s media agency, Rossiya Segodnya, according to the digital investigators that led a parallel investigation. The campaign focused on amplifying Rossiya Segodnya's online outlet Sputnik, and to a lesser extent, its video service, Tok. The pulled pages were investigated through their open-source code by the Digital Forensics Lab (DFR Lab), which is part of The Atlantic Council, an American think tank. DFR Lab has a partnership with Facebook. Although the content was occasionally political, like anti-NATO posts, or support for the President of Tajikistan, the majority were lifestyle oriented — weather, travel, beautiful women. That infrastructure was by design, the researchers said. "Kremlin influence campaigns begin by building an audience. That way they have an oven-ready readership when they need to spread disinformation. This Sputnik operation was building the audience. If it had succeeded, it would have created a bigger potential market for pro-Kremlin messaging," Ben Nimmo, DFR Lab's senior fellow for information defense, told ABC News. "This was a numbers game. These pages existed to boost Sputnik's engagement figures." (@DFRLab) Graphic showing the various focuses of the pages. 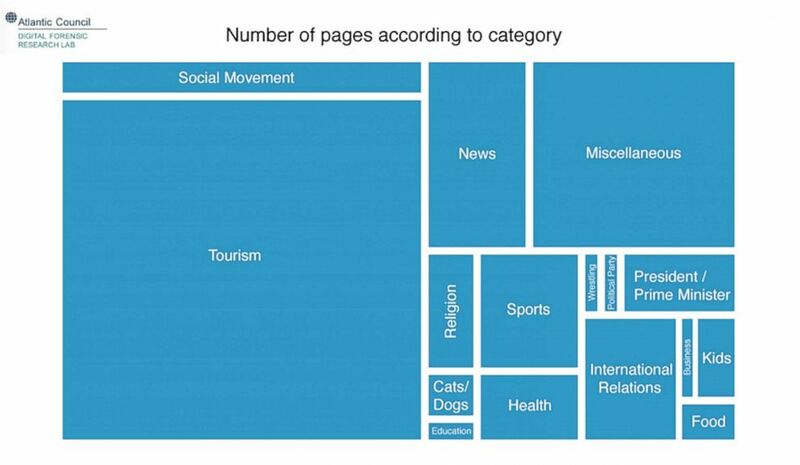 The larger the box, the more pages covered that category. "We are constantly working to detect and stop this type of activity because we don’t want our services to be used to manipulate people. We’re taking down these Pages and accounts based on their behavior, not the content they post. In these cases, the people behind this activity coordinated with one another and used fake accounts to misrepresent themselves, and that was the basis for our action," Facebook wrote in a blog post on Thursday. Facebook identified 266 pages focused on 13 countries: Kazakhstan, Kyrgyzstan, Tajikistan, Uzbekistan, Armenia, Azerbaijan, Georgia, Moldova, Romania, Belarus, Estonia, Latvia, and Lithuania. "Most of the pages posed as special-interest groups covering a wide range of issues. These included tourism and weather (the most popular topics), food, fashion, beautiful women (but not beautiful men), pets, sport, culture, and various politicians,” the DFR Lab researchers wrote in a post on Medium on Thursday. (DFRLab) Sputnik posts shared by the Georgian fashion page. As Facebook noted, the content itself was not considered inappropriate behavior. For example, a page focused on Georgian fashion primarily posted articles about fashion...from Sputnik. Accounts also cross-posted content — again, from Sputnik — which can only be done with permissions from both accounts, proving a relationship. 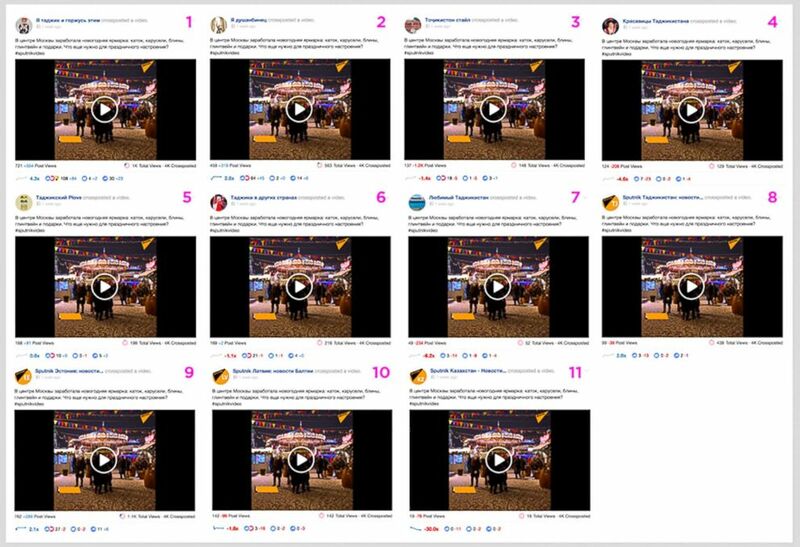 "A Sputnik video about a Christmas market in Moscow was cross-posted on Sputnik Tajikistan, Sputnik Kazakhstan, Sputnik Estonia, and Sputnik Latvia, plus seven inauthentic pages about Tajikistan," the DFR Lab researchers wrote. (DFRLab) Translated from Russian: “Christmas market started in the center of Moscow: a rink, carousels, pancakes, mulled wine and gifts. What else do you need for a holiday mood? Policial pages were also misleading about their origins. A fan page for the president of Tajikistan, Emomali Sharipovich Rahmon, said "the founder of peace and national unity, the leader of the nation. Created by the people of Tajikistan for the people of Tajikistan" when it was actually managed from Russia. 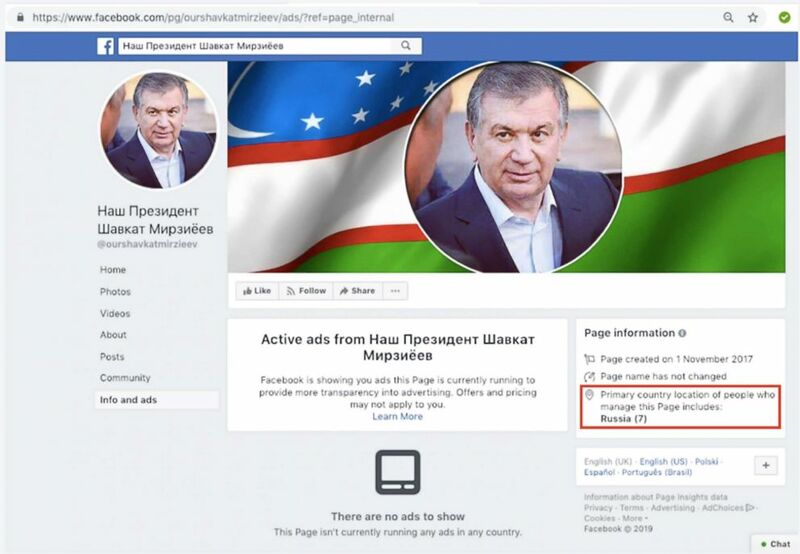 Similarly, a mirror fan page for Uzbekistan President "Shavkat Miromonovich [Mirziyoyev], as the spiritual and national leader,” was created three weeks after the Tajikistan presidential one — also managed from Russia. (@ourshavkatmirzieev/archive via DFRLab) "Info and ads" section shows the location of its managers. Some central Asian experts familiar with Soviet tactics agree. Rafael Sattarov, a Carnegie Moscow Center expert on Central Asia who works with the Bilig Brains analytical project, said this is par for the course with Russia. "Russia tries to control everything and everyone in central Asia. Russia tries to come back to central Asia like Bolshevik or [the] Red Army," Sattarov, who is originally from Uzbekistan, told ABC News. "Facebook is the most popular social media network in Uzbekistan, Tajikistan and Kurdistan, and Russia uses it to promote its interests and agenda." "There are lots of clones of Russian Sputnik," Attarov added. "A lot of young people stop watching television. [The] Russian government understands [that from] 2016 to 2018, television worked only for elderly people with Soviet backgrounds, but not for us, not for young people." The pulled pages registered 853,413 followers, or 170 percent more than the total number of followers (495,947) of Sputnik’s official pages in the same countries. Facebook removed 364 similar accounts one year ago for "inauthentic behavior." A similar move was also taken last August. Sputnik criticized Facebook's actions, invoking "censorship." "The decision is clearly political in its nature and, as a matter of fact, is practically censorship — seven [Facebook] pages belonging to our news hubs in neighbouring countries have been blocked. Sputnik editorial offices deal with news and they do it well," Sputnik's press service said. "Russia-based media Sputnik and RT have repeatedly come under attack by Western officials, who blamed the news outlets for alleged attempts to sway public opinion worldwide. The leadership of the broadcasters, as well as the Russian authorities, dismissed the claims saying, that mainstream media were not interested in the presence of an alternative coverage of events and condemned the accusations as attacks on free media," according to a story on the Sputnik International site.